This Manifesto is the fruit of a mature reflection during the toughest period of the crisis which swept across Europe, and out of which we are hardly stepping. Along with it, the belief in the ability of the European project to promote and secure collective well-being has been seriously fractured and undermined. With its response by austerity, taking harsh measures without dialoguing with its citizens, the EU itself fed the radical attitudes that could lead to the very disappearance of the idea we have been working together for half a century. Even those who believe in Europe, but in a Europe based on democracy, social justice and solidarity, are loosing hope. We believe another Europe is possible. A Europe based on citizens trust in legitimate institutions at all levels and striving to reach social cohesion. We believe that the deficit of legitimacy EU decisions suffer from, which has nourished the populistic discourse, can be fought back by building a truly inclusive and cohesive society. EU policies must ambition to combat poverty, social exclusion and unemployment. 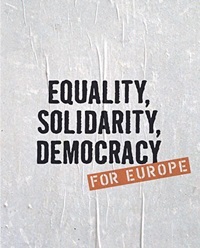 By rebalancing finance and economy with social justice, taking into account the social dimension of the EMU and supporting it by EU wide redistributive policies linking cohesive policies and active citizenship, we can hope for the revival of the European ideal of peace, prosperity and democracy.